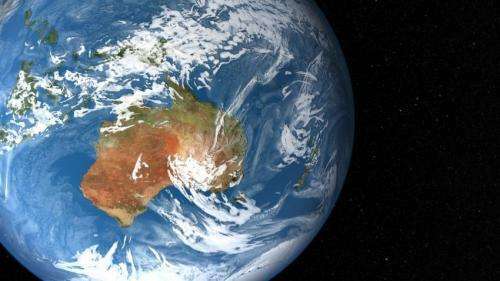 The impact humans have made on Earth in terms of how we produce and consume resources has formed a 'striking new pattern' in the planet's global energy flow, according to researchers from the University of Leicester. The research suggests that the Earth is now characterised by a geologically unprecedented pattern of global energy flow that is pervasively influenced by humans - and which is necessary for maintaining the complexity of modern human societies. The new study, published in the journal Earth's Future, is led by Professors Mark Williams and Jan Zalasiewicz of the University of Leicester's Department of Geology working with an international team of scholars. While analysing the Anthropocene phenomenon - an epoch where humans dominate the Earth's surface geology - the team identified that human patterns of production and consumption are a key factor characterizing the epoch, and when measured against the billion-year old patterns of planet Earth, they form a striking new pattern. Professor Zalasiewicz said: "Very big changes in our planet's pattern of biological production and consumption do not happen very often. The appearance of photosynthesis was one, about two and a half billion years ago. Then, a little over half a billion years ago, animals like trilobites appeared, to add scavengers and predators into a food web of increasing complexity. "Other major events have happened since, such as five major mass extinctions, but even measured against these events, human-driven changes to production and consumption are distinctly new." Dr Carys Bennett, co-author on the study from the University of Leicester's Department of Geology, added: "It is without precedent to have a single species appropriating something like one quarter of the net primary biological production of the planet and to become effectively the top predator both on land and at sea." In addition, by digging phosphorus out of the ground and by fixing nitrogen out of the air to make fertilizers; and by exploiting hundreds of millions of years-worth of stored carbon-based energy in a still-accelerating trend, humans are increasing productivity well above natural levels - and directing much of it towards animals that have been re-engineered to suit our purposes. Professor Zalasiewicz added: "This refashioning of the relationship between Earth's production and consumption is leaving signals in strata now forming, and this helps characterize the Anthropocene as a geological time unit. "It also has wider and more fundamental importance in signaling a new biological stage in this planet's evolution". Archaeologist Dr Matthew Edgeworth, Honorary Visiting Research Fellow at the University of Leicester's School of Archaeology and Ancient History, added: "Recent changes in the Earth's biosphere, caused in part by human activity, are starting to become evident in rock and soil strata. Unprecedented stratigraphic signals are challenging disciplines like geology and archaeology to assess such changes and put them in temporal context, relative to other major transitions in Earth's history." Dr Colin Waters of the British Geological Survey said: "Modern human society is structured around economic production and consumption and our recent perturbation of the balance between the two, notably since the mid-20th century, will leave a signal that will provide a lasting legacy of our existence on this planet." "It is without precedent to have a single species appropriating something like one quarter of the net primary biological production of the planet and to become effectively the top predator both on land and at sea." Now this statement is a little stretched. To put it in context, humans have stopped appropriating production at the end of Neolithic. Since then, they are growing their own food. So instead of "appropriating" a better term may be "substituting", although displaced natural production would be less than the 1/4 that humans achieve. Also, the "top predator" mention likens humans to lions or wolves, but completely neglects that unlike those animals, humans actually grow their own species for food. Those species would fare poorly without humans. Wheat would appear only sporadically and sheep would probably inhabit only mountains without humans. It's humans that help thrive those species and many others. So humans are not simply "top predators", but rather "top gardeners". And about the only species that cares for something else than its own survival. You wouldn't have liked the Earth if it had ended at the mercy of lions or wolves. Gigel, you are missing the point. If you appropriate habitat, you appropriate that habitat's production. And we ARE the top predator. We harvest all life forms, including the predatory lifeforms you mistakenly call the "top predators'. And, as we appropriate habitat, we reduce the survival prospects of those animals. That appropriation takes many forms. If our actions cause changes to seawater chemistry, and the corals of the oceans get bleached, we have appropriated their habitats without even making a personal appearance. A predator does not cultivate its prey. It's a destructive association where one animal eats another without attempts to keep the prey species alive. Lions don't farm antilopes, they simply kill them, and if they run out they die. The term "Anthropocene" is anti technology propaganda against Vernadski's Noosphere.